Two recent conversations inspired this post: hearing about a family member who suffered from dehydration after a long day in the sun without adequate fluids, and a friend who has been bothered by a recurring cold since she started working in a new office. To both I say, “Drink up!” In addition to eating clean, staying hydrated is essential in the maintenance of good health. Below are a few good-for-you drinks I consume daily. I love starting my day with this lemon juice tonic. Squeeze the juice of half a lemon into a glass or mug and fill with just-boiled, filtered water that has cooled for a few minutes. I remember my grandmother drinking hot lemon water (she would also squeeze a lemon slice right into her mouth without making a face!). It naturally provides a fresh-from-the-fruit dose of vitamin C and is said to kick-start the system, detoxify, and provide balance. Stir one to two tablespoons of apple cider vinegar into a glass of water—cold or warm—for a boost of detoxifying vitamins, enzymes, and minerals. 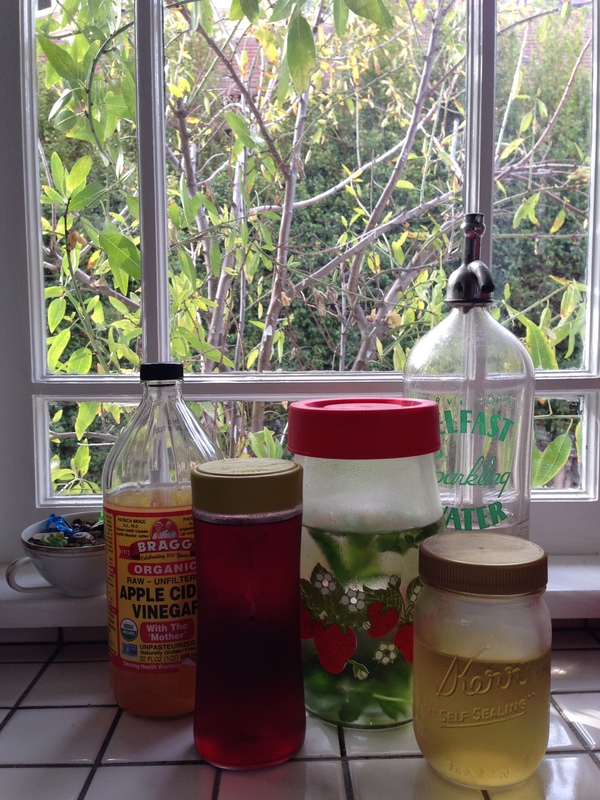 Be sure that the apple cider vinegar is organic and unrefined (I like Bragg’s) and shake the bottle before use. Optional: stir in honey and sprinkle in some cinnamon (the cinnamon never fully dissolves but adds some flavor and provides another antioxidant boost). I like to have this tonic mid-afternoon, right around the time my energy starts to wane. Instead of reaching for something sugary, I’ll drink this to feel revived. Sometimes I add cut fruit (fresh or frozen), sometimes cucumber slices, sometimes fresh mint or lemon verbena. It’s so easy and good—just drop into a pitcher or container of water and refrigerate. Also consider adding something to your reusable water bottle when you’re on-the-go and add frozen fruit to your water bottle instead of ice cubes on hot days. I also like adding a splash of chilled hibiscus or chamomile tea (see below). Hibiscus tea is an infusion easily made with dried hibiscus petals and hot water. I love the tart flavor and drink it straight-up, combined with green tea, or chilled and sweetened (agua de fresca). It contains vitamin C and minerals and studies suggest it could help lower blood pressure and ease digestive woes. To easily enjoy it all week long, I make a batch and keep it chilled in the refrigerator. It’s also good for topping off a hot cup of tea or adding a boost of flavor to water or regular iced tea. Green tea, long known to be an antioxidant, is my go-to for an afternoon cup of tea. When it’s cool out or I’m working in an air-conditioned office, I reuse the tea bag and refill my mug with hot water all afternoon—this keeps me warm and limits my caffeine intake. Extra boosts to add: hibiscus tea or a few dried hibiscus petals; lemon juice or a lemon slice; grated ginger. Or, stir with a cinnamon stick. Here’s my bedtime drink: half a cup of chilled camomile tea with a splash of apple cider vinegar. Chamomile is known for its calming effect and I heard that consuming apple cider vinegar helps ensure restful sleep, so I’ve combined them. I make several cups of chamomile tea in advance and keep it chilled in the refrigerator.